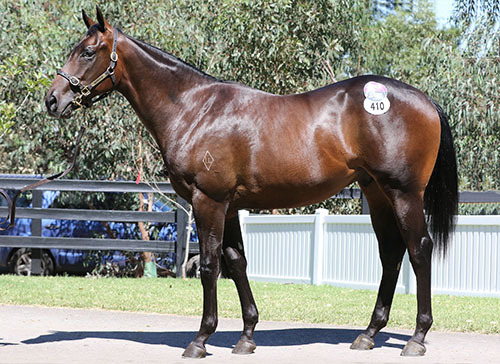 It is no secret that success brings success and with a lightly raced stallion like BRAZEN BEAU, who is a Son of the all-conquering I AM INVINCIBLE his success at stud is almost assured. A GROUP 2 winner as a 2YO in the BRC Champagne Classic BRAZEN BEAU would go on to win 4 more races, which included the GROUP 1 VRC Coolmore Stud Stakes AND the GROUP 1 VRC Newmarket Hcp defeating Chautauqua and Terravista, AND the GROUP 2 ATC Roman Consul Stakes defeating Nostradamus and Delectation. BRAZEN BEAU ran seconds in the GROUP 1 VRC Lightning Stakes AND the GROUP 1 Royal Ascot Diamond Jubilee Stakes at Ascot and was retired shortly after to Darley at Northwood Park Victoria where he currently stands at a fee of $44,000. He retired as a Champion 3YO Colt of his generation in 2014-15 and a rare hero of the GROUP 1 Newmarket as a 3YO! Having met physical criteria, the icing on the cake for me (and Mick as he speaks about on the video) is the Colts pedigree. Pedigree pages reflect either success OR lack of success in family generations-they don’t lie and it gives us all the factual information of any yearling based on past history, the only thing it doesn’t show is the future, however It would take a very brave man to say that this Colt won’t be achieving success, as his Pedigree has everything I require which are a consistent flow of winners through the dams with a sprinkling of BLACK TYPE. In this Colts case there is a plethora of BLACK TYPE! The Colts Dam Graceful Devil has produced 5 winners from 6 foals to race including Graceful Devil’s latest 2YO of this season in Graceful Storm, a filly who has had 2 starts for 2 wins for John Moloney including a very impressive win at Sandown in December which does suggest that the best may yet be ahead for this mare AND confirms that she can throw a 2YO and a Metropolitan one at that! The second Dam Prayerful (a LISTED winner herself) has had 7 foals to race for 6 winners and from that branch of the Colts family it included MONTOYA’S SECRET- a winner of the GROUP 1 Vinery Stud Stakes, GROUP 3 Auckland Cup winner DELAGO’S SECRET and other black type performers including DENDEE,DIVINE SECRET (3rd in a GROUP 1 Blue Diamond),SECRET DELIGHT and POSEIDON’S SECRET whilst the third Dam SO ELATED was an outstanding broodmare herself having had 13 foals to race for 10 winners including the brilliant EXCITED ANGEL-a winner of the GROUP 2 VRC Bloodhorse Breeders Plate, GROUP 3 MVRC Diamond Jubilee Stakes, GROUP 3 STC Queen Of The Turf Stakes, GROUP 3 Coongy Hcp and was multiple GROUP 1 placed in the VATC Futurity Stakes, VATC Toorak Hcp and VRC Nissan Stakes, TEXT’N HURLEY-winner of the GROUP 2 MVRC Sunline Stakes, TYPHOON-winner VATC Coongy Hcp as well as ACQUIVER- a listed winner who ran 3rd in the GROUP 1 MRC Futurity Stakes. As everyone can no doubt tell I am VERY excited (as is Mick) to have purchased a SUPER VOBIS/VOBIS GOLD Colt who ticks ALL of our boxes on type, who has such an outstanding pedigree and who is by one of THE most exciting first crop stallions in BRAZEN BEAU and topping it all is off is that he is a home grown Classic Australian Colonial stallion, typical of the Australian Stallions that have stood the test of time and PROVEN to stand above all in success generated! I am extremely proud for him to coming under the United Syndications banner and invite you to join us on our journey to the winners stall!